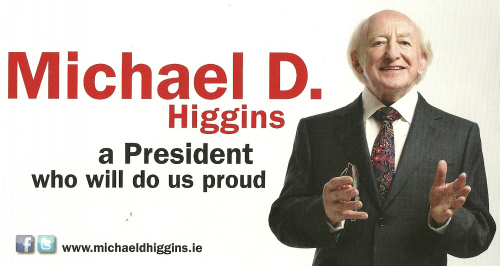 From the 2011 Presidential Election a leaflet from Michael D Higgins “A President To Do Us Proud” . Many thanks to the candidate for sending this (and other material ) on. that the many rich have continued against poor people around the world and at home. Labour and Fine Gael lied to the electorate in Sligo and Leitrim and South Donegal in February General Election, ie promised a ninth centre of excellence for breast cancer care and return of mammography services to Sligo General Hospital. It has not happened and we ask voters note to vote for either party. The media luvvies – such as Vincent Browne and John Waters – have not been upfront and transparent with their readers either. They should have declared their voting intentions at start of the campaign.